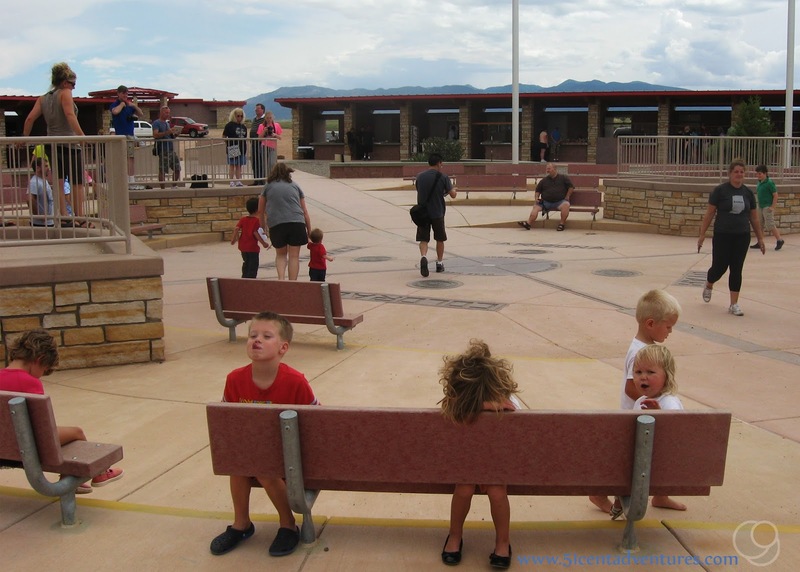 Description: The Four Corners Monument is the only place in the United States where four state lines touch. 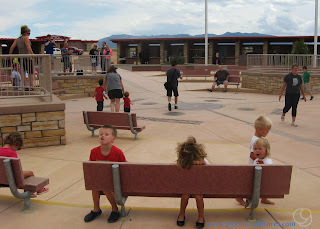 Utah, Arizona, Colorado, and New Mexico all come together at the Four Corners Monument. People enjoy coming here so they can say they stood in four places at once. Location: The monument is located just off of US Highway 160. The monument is on the Navajo Nation Indian Reservation, and is managed by the Navajo Nation. It is 6 miles from Teec Nos Pos, Arizona; 33 miles from Shiprock, New Mexico; 40 miles from Cortez Colorado, and 48 miles from Bluff, Utah. Operating Seasons and Hours: Open every day except Thanksgiving Day, Christmas Day and New Year's Day. Hours are generally from 8:00 am to 5:00 pm, though the park is open as late as 8:00 pm during the summer. 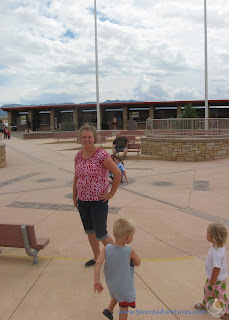 This was about the only sightseeing stop my sister and I made while we caravanned from Texas to Utah. 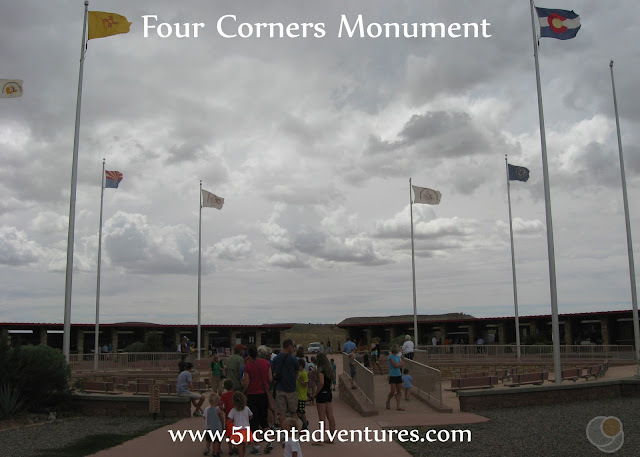 We traveled from Gallup, New Mexico to Shiprock, New Mexico and then decided that we should go check out the Four Corners Monument. All day we'd been debating about whether or not we should check out the monument. 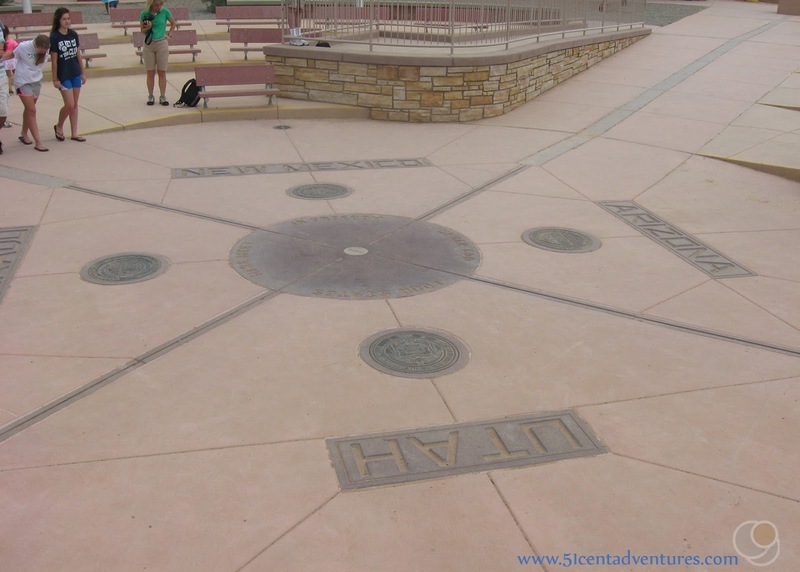 Even though we grew up in Utah, we'd never visited the four corners area. Going to the monument had always been something we wanted to do. But we'd never gone because we'd heard that the monument was a lame place to visit. However, our route would take us within 30 miles of the monument so it wouldn't waste too much of our time to travel there. We talked about it at every stop along the way that day. Finally my sister said, "We'll always regret it if we don't go. We still might regret it if we do go, but at least we'll have gone." 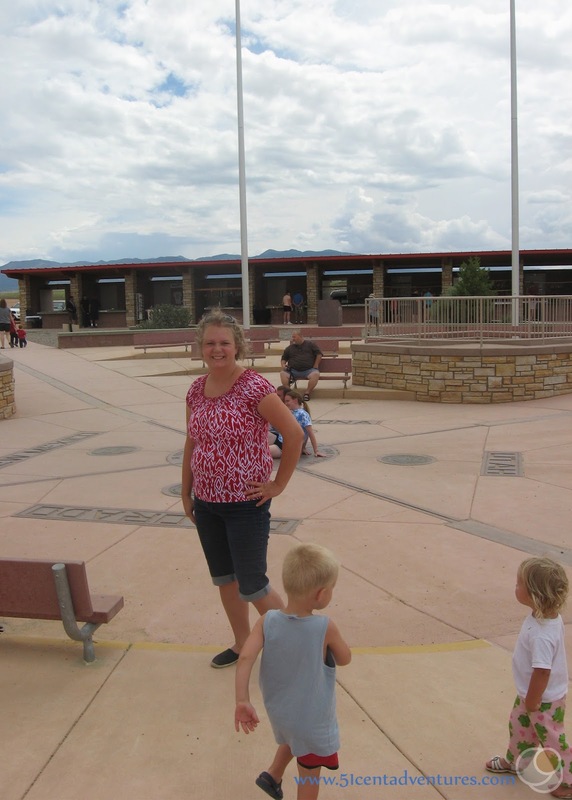 Prior to that day I honestly thought that the Four Corners Monument was part of the National Parks System. I assumed it was a National Monument. I was thinking that I use my National Parks Pass to visit the monument. However, after a little bit of research on my sister's smart phone, we discovered the monument was really owned and managed by the Navajo Nation. My sister called ahead to find out what the admission price would be. A pre-recorded message stated that it would cost $5 per car. That seemed reasonable. Our route took us to Shiprock New Mexico. 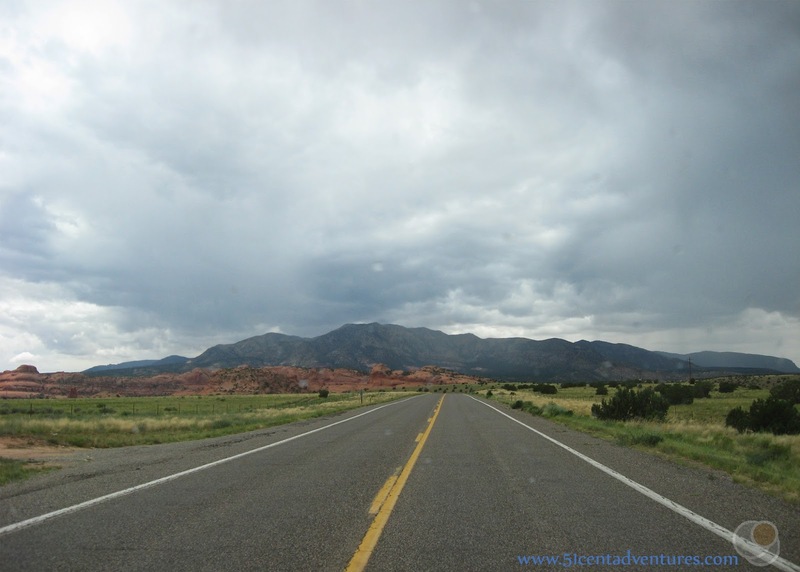 After a quick bathroom break we turned northwest and crossed into Arizona before turning northeast and angling up to the Four Corners Monument. The scenery was really pretty. I figured that even if the actual monument turned out to be a bust, at least the drive was worth it. When we reached the monument, I turned off of the highway and immediately saw a sign advertising the admission price. According to the sign the cost was $5 per person. I had five people in my car, and there was no way I was paying $25 to go there. Then I noticed that children under 6 got in for free. So I ended up only needing to pay $5 anyway. The lady at the gate seemed a little perplexed that I was the only adult in a car with 4 babies, but it was the truth. Immediately, I was very unimpressed by the monument. I don't really know how to say this nicely, but well, you can totally tell that it's managed by the Navajo Nation. It's certainly was no national park. Everything just seemed kind of run down and sad. The parking lot was made up of dirt and gravel. After we got out of the car we walked over to the actual monument. 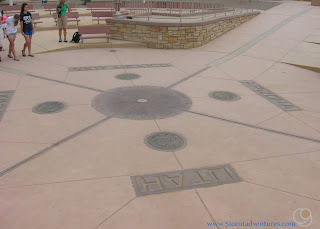 It was a large area with lines drawn in the cement to mark the four states. All around the monument there were shops where people sold Indian Jewelry. There was also a long line of people waiting for their turn to take a picture of themselves standing in four places at once. The line was taking forever so we gave up and moved to the Colorado side. We just took a picture of the kids in front of the monument. The kids were all pretty fed up with the whole thing and you can tell. We did get a good picture of me though. I also took a picture of the monument between other peoples' turns. I figured we could always photoshop a picture of my kids laying on the monument. We took a few more pictures. But we didn't stay long because my older kids were very upset about not being able to take any rocks home with them. They cried the whole way to the car. I ran to the bathroom before we left. All they had were vault toilets - which was understandable considering we were in the middle of nowhere. But what got me was the signs on the doors. Each door had a little sign that said, "locks don't work. Please knock." I rolled my eyes and told the lady standing next to me. "For 5 dollars a person you'd think they could put locks on the bathroom doors." I was very fed up with the whole place. 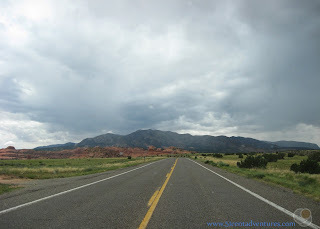 We left the monument area and started driving to Utah. Again the road was very pretty. I was glad that at least we got to see some pretty scenery. I don't regret going to the Four Corners Monument. I'm glad that I finally got to see it. But I'm also glad that I only had to detour a total of about 40 miles and that seeing the monument only cost me $5. I know I would regret the visit if I had spent more time or money. 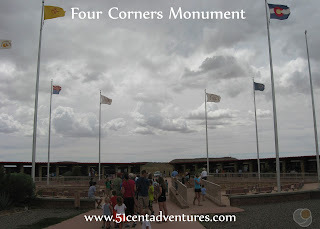 Recommendation: If you are going to be in the Four Corners area it is probably worth it to stop and see the Four Corners Monument. But if you plan a trip to the area solely to see the monument, then you will be very disappointed. You'll probably have a better experience than me if you go early in the morning or during the non-summer months. That way there will be less of a wait time to take your picture on the monument. Also I should note that there wasn't anywhere to buy food or to get water - so plan accordingly. 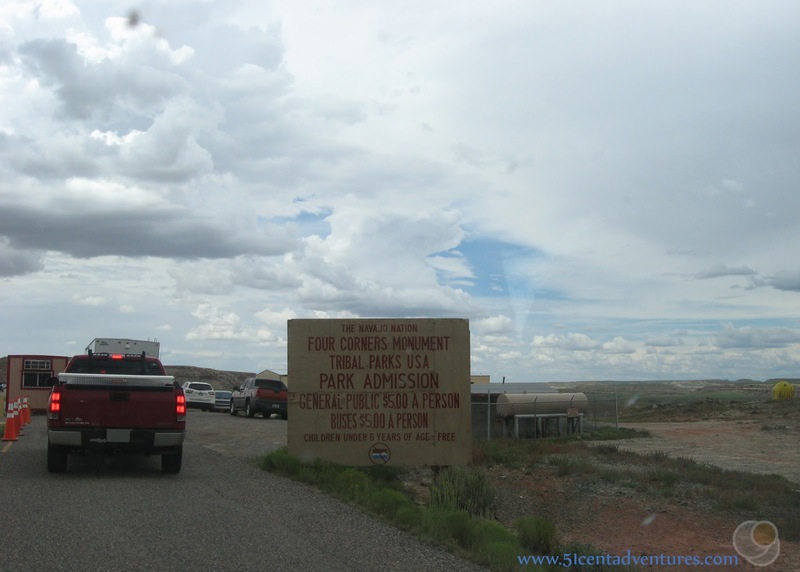 Directions: The route you take to the Four Corners Monument will depend on which state you are travelling from. 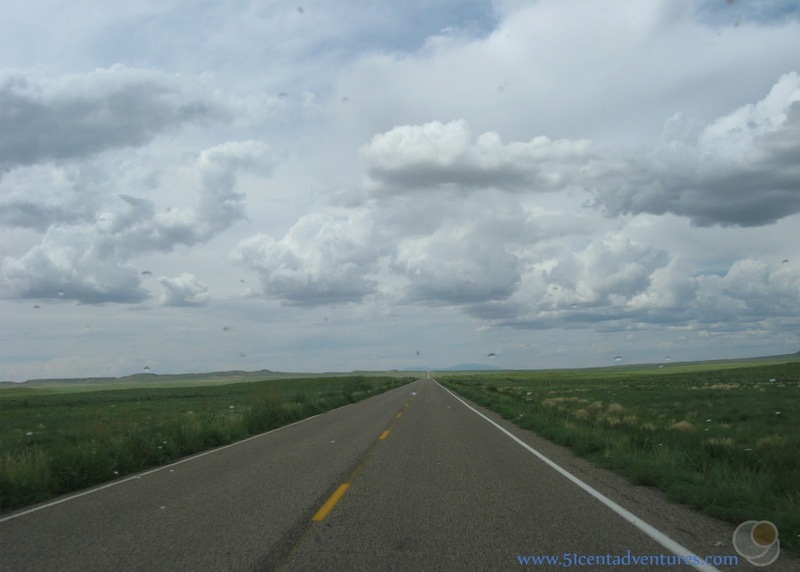 Generally the two best ways to reach the monument are to either travel to Shiprock, New Mexico or Cortez, Colorado. Once you reach either of those cities there will be signs to direct you to the monument. 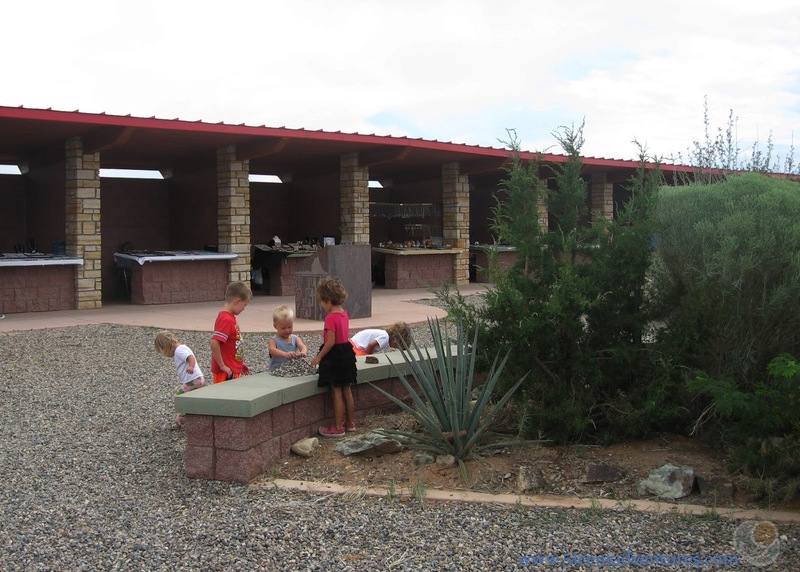 The monument itself is located less than a mile from US Highway 160 which runs between Teec Nos Pos, Arizona and Cortez, Colorado. The monument is the only thing on that road so you can't miss it. Additional Information: Four Corners Monument is only one of the Navajo Tribal Parks that the Navajo Nation Manages. 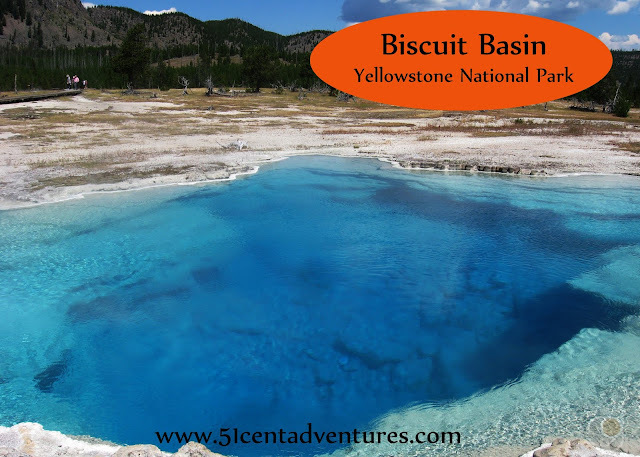 Check out this link for a map of the tribal lands and the parks on them. Even though I had kind of a bad experience at Four Corners I still want to visit some of the other park managed by the Navajo Nation. Monument Valley is one of the places that I really want to see. Places Nearby: Mesa Verde National Park is only 50 miles away in Colorado. Mesa Verde is becoming something of a unicorn for me because it's never works out for me to go visit that National Park. On this trip I didn't even consider stopping there because I didn't want to be disappointed. But one day I will go there.